They'll be no shortage of alien dismemberment in the future, not if Visceral Games gets its way. Visceral Games has a tale it wants to tell with the Dead Space games, and part of its motivation for making Dead Space 2 as good as it can is so that it can make Dead Space 3 and continue telling the story. Dead Space 2 executive producer Steve Papoutsis said that Visceral had a rough outline of where future Dead Space games would go. He said that the level of detail wasn't particular high, but it also branched into other media like the Dead Space novel Martyr and into the history of the setting, like the creation of the Unitology religion. 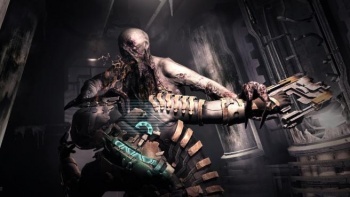 Papoutsis is under no illusions that Dead Space 3 is a certainty however, and says that it's going to take an "outpouring of support" for Dead Space 2 in order for a second sequel to be made. He said that the cost and planning that went into making a blockbuster game meant that it didn't make sense to do it if the support wasn't there. If the support is there though, Papoutsis said that Visceral would happily keep making Dead Space games until people got bored of them. "I worked on a lot of different games," he said. "15 years worth of games. This is probably the most support I've ever seen for a franchise I've been on. So it's pretty cool." Dead Space 2 will be released for Xbox 350, PS3, and PC on January 25th.